Marina Centro di Rimini is the heart of Tourist Rimini (which promotes sea and sun more than culture and museums): in 1843, the aristocratic brothers Alessandro and Ruggero Baldini (who lived in the sumptuous palace situated under the clock in Piazza Tre Martiri) and their friend Claudio Tintori founded the first Bathing Establishment. Rimini's town layout changed a lot and a new avenue (Viale Principe Amedeo) was built to connect the old town with Marina Centro. In 1857, huge infrastructures were built to foster the development of the new tourist districts: the Municipal Theatre in Piazza Cavour and, in 1861, the railway line Bologna - Ancona. In '900, plenty of elite tourists flocked here to spend pleasant holidays in Rimini. In 1908, the Grand Hotel was inaugurated in Marina Centro. Later on, Rimini gradually began to attract families too. 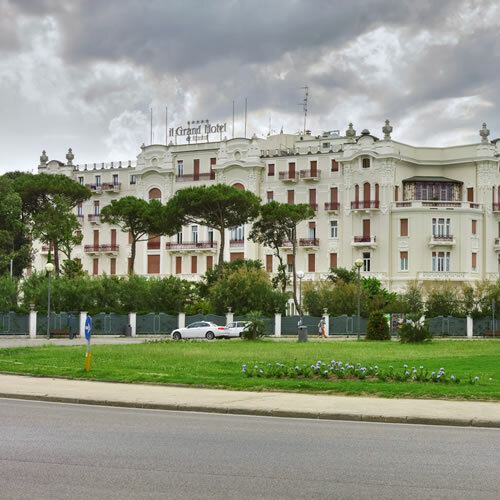 "La Marina", as "grandparents" called Marina Centro di Rimini, is situated at the end of the tree-lined avenue ("Viale Principe Amedeo") which connects the railway station with the beach, and is dominated by the famous Grand Hotel. This luxury hotel was celebrated by "Amarcord" by Fellini, who said: "During summer evenings, the Grand Hotel turns into Istanbul, Bagdad, Hollywood. Its terraces, sheltered by lush trees and plants, maybe hosted Ziegfield parties. The backs of the women, embraced by elegant men dressed in white dinner-jackets, seemed gold, and a scented breeze carried sweet music". 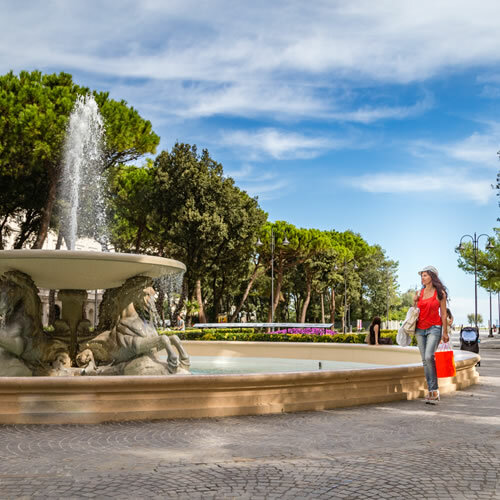 If you are interested in spending your holidays in Rimini but you can't afford to stay at Grand Hotel, book a Hotel in Marina Centro di Rimini. Marina Centro di Rimini is easily accessible from the A14 Motorway, "Rimini Sud" Exit (follow signs to Rimini mare), or through regular buses no. 11, bus stop no. 10. It is situated 1 kilometre far from the old town in the direction of the sea. Hotels in Marina Centro di Rimini are the most appreciated accommodation facilities of the city. Marina Centro hosts the elegant Grand Hotel, which was repeatedly celebrated by Federico Fellini. 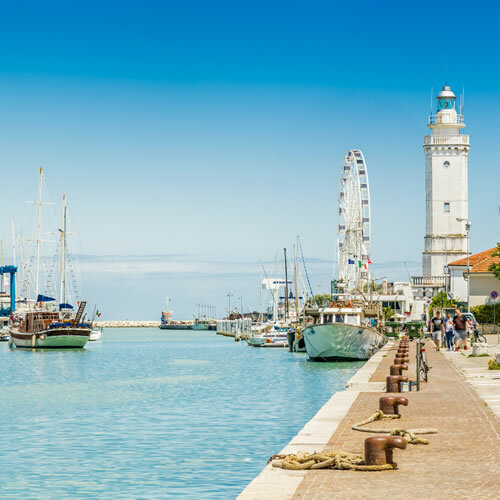 "La Marina", as grandparents called Marina Centro, is Rimini's oldest tourist settlement.